The Business Long Stay Visa (also called a "Work Permit" visa) is a TEMPORARY visa through which an Australian or overseas employer who would like to appoint you to fill a nominated skilled position in Australia can employ you for a period of up to four years. The visa will be granted for the length of your contract (up to a maximum of 4 years) and you may lose the visa if you are made redundant. 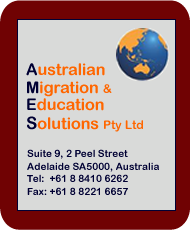 Before the visa expires, you would need to either leave Australia or apply for another temporary visa. have been granted Standard Business Sponsorship approval,This sponsorship approval allows employers to sponsor a specified number of temporary business entrants within a two year period or until the maximum number of temporary business entrants specified on the application has been reached. meet costs and other obligations. be included in the current "Consolidated Sponsored Occupations List (CSOL)"
meet the minimum salary level for the nominated occupation (which is currently set at A$51,400 or higher as per the current Market Salary rates and A$180,000 for exempted appointments such as Managers and Doctors). you and any dependent family members must meet mandatory health and character requirements.